Questions about how to stream DVD to TV from computer and the like keep popping up on various communities and forums. Therefore, we particular wrap up the top 3 feasible ways to stream DVD to TV, either wirelessly or wired. Just make up your mind according to your available devices or budget for streaming gadgets. Incorporating Apple's Airplay wireless streaming technology, DearMob 5KPlayer delivers the easiest way to free stream DVD to smart TV via Apple TV 4/3/2. Just give it a whirl and see how this Apple TV mirroring server can extend your visual experience to the utmost. Streaming DVD to Apple TV may be the easiest way to play DVDs on TV without DVD player. The problem is that DVD is not an Airplay compatible format, meaning it can't be streamed directly via Airplay. But thanks to Apple TV Airplay mirroring which saves you from the time-consuming task of ripping DVDs before watching, you can now stream DVD to TV wirelessly from your iMac, Mac mini, MacBook Air and MacBook Pro. In order to Airplay mirroring DVD to Apple TV, you should first make sure the DVD can be opened by your Mac. But you'd better get yourself psyched up for things may backfire on you. Lots of Mac users report that the error message "The viewer could not be moved to selected screen." pops up when mirroring DVD to Apple TV. Why? Because the default Apple DVD Player fails to open the DVD video. Thus, to make sure successful DVD to TV streaming, you will need an Apple TV mirroring server - 5KPlayer. Step 1: Free download DearMob 5KPlayer for your Mac (macOS High Sierra compatible) and launch it. 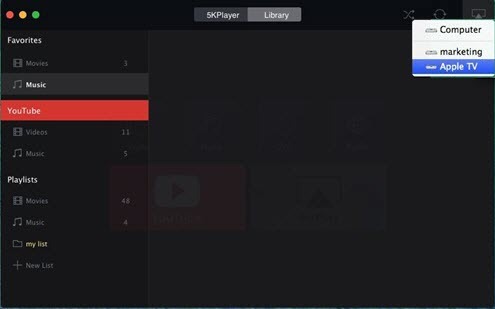 Step 2: Click Airplay on the up right corner of 5KPlayer interface and choose your Apple TV. Step 3: Drag and drop the DVD to 5KPlayer interface for playback. Then the AirPlay mirroring will start and you can see the DVD video displayed on your smart TV. * Make sure your Mac and Apple TV are connected to the same Wi-Fi network. * Windows users should first rip the DVD to MP4, MOV or M4V and then use 5KPlayer to stream DVD to Apple TV. When it comes to playing and streaming DVD, DearMob 5KPlayer must be the best answer. It enables you to Airplay mirror DVD from Mac to Apple TV directly and stream DVD to TV from Windows PC by ripping. More remarkably, it is one of the best DVD player software that is able to play encrypted DVDs, DRM protected DVDs, region-coded DVDs, as well as the most popular blu-ray DVDs. With this robust Apple TV mirroring freeware installed on your Mac/PC, you can get a perfect DVD to TV streaming server and a DVD player at a time. Boasting the ability to cast anything you love to TV, Google's Chromecast is another decent option for streaming DVD to TV wirelessly. Like Apple Airplay, Chromecast works only if the streaming contents satisfy required formats and specifications. Thus, to chromecast DVD to TV from your computer, you should firstly rip the DVD to Chromecast with a fast DVD ripper, such as WinX DVD Ripper Platinum. Step 4: Click the Google Cast icon in Chrome's tool bar and select your Chormecast device. Then the DVD will be streamed to TV wirelessly through Chromecast. Step 1: Position your desktop PC or laptop next to your TV, for most HDMI cables are only 6 to 10 feet long. Step 2: Connect the HDMI cable to both the computer and the TV. Remember to attach any adapters you may need in order to establish the connection between your PC and smart TV. Step 3: Consult your TV's user guide and set your TV to the input coming from your computer. Step 4: Play the dvd on your computer, then you can find it displayed on the big screen. Note: The 16:9 aspect ratio of your computer may cause image distortion when displayed on a high-definition TV. So adjust the desktop resolution if necessary when streaming a DVD to TV.